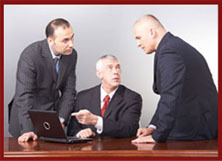 A Tech Investigation Services Inc. : Attorney Services . : A TECH INVESTIGATION :. Determining guilt or innocence can be an exercise in futility without an arsenal of investigative tools. Armed with these tools, A Tech Investigation Services, Inc. will provide the evidence necessary to expedite your case. Our staff consists of ex-law enforcement and military personnel who have experience in all aspects of civil and criminal investigations. © 2011 A Tech Investigation Services, Inc.